Set in the forests of Alsace, La Clairière is in complete harmony with its sylvan surroundings. The principal goal of La Clairière is to provide you with a place that is in complete harmony with nature where you can leave behind the stresses and strains of everyday life and regenerate yourself, recharge your energy levels, and achieve a state of optimal well-being. La Clairière is an ideal escape where you can reconnect with nature and your own inner sources of wisdom and inspiration, helping you to adopt a more harmonious lifestyle. La Clairière, prides itself on creating a friendly, sincere atmosphere to make you feel genuinely welcome, relaxed and refreshed. At La Clairière, all treatments take a holistic approach and serve a single purpose: to keep you in good health. A wide range of treatments are offered based on traditional therapies and relaxation techniques which help maintain focus, balance and harmony of body and mind. Energy therapies bring balance and harmony to the vital energy within your body. They leave you both physically and psychologically relaxed and refreshed. Traditional Chinese Medicine (TCM) and Ayurvedic therapies focus on 4 basic themes: a balanced diet, breathing exercises, meditation and physical therapies for the body. Golf de Bitche is located in Bitche 32kms away from bio&spa at La Clairière. La Clairière, believes in the age-old knowledge of traditional medicines. We adapt this knowledge, making it relevant to your present-day needs. Our holistic treatments and therapies take inspiration from both Eastern and Western traditions. The Spa is, quite literally, a window onto the forest. Bathe yourself in the stillness and calm emanating from the trees. Let the vapours from the steam baths clear your airways and stimulate your circulation. Detox your body and relax your mind in the dry, intense heat of the saunas. Feel re-energised as you enjoy the foot spa, the invigorating cold water plunge pool and the ice fountain. The Whirlpool and the heated outdoor pool are specially designed to help you relax by releasing tension in the muscles. If you're feeling more active, you can use the gym or swim some laps in the indoor pool. True to its name, La Clairière is nestled in a clearing near the edge of the forest. The contemporary design of the building perfectly complements the peace and tranquility of the location. Open your bedroom window and inhale the woody fragrance of the forest and the pure mountain air, bursting with oxygen.Rooms fall into three categories: Classique, Confort and Superieure. The interior design was inspired by the natural surroundings. It plays on the natural beauty of wood, reflecting the tones and hues of the forest. 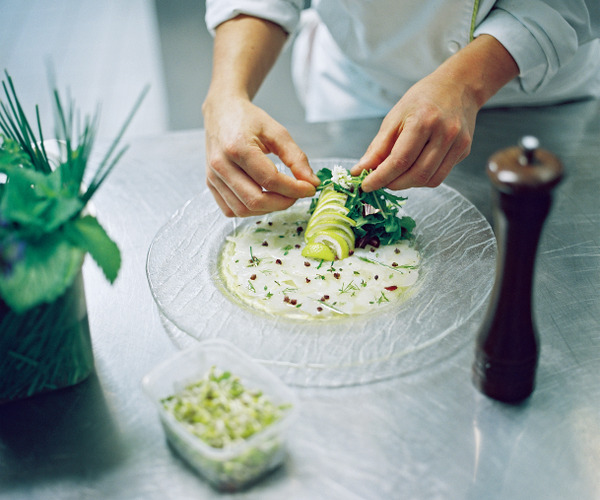 The chefs at La Clairière pride themselves on serving you the best that nature has to offer through a variety of culinary experiences. Re-discover the pleasure of food in a relaxed, friendly atmosphere. There is a seasonal menu and the wine list includes a selection of the best organic French wines. Besides a tasty selection of vegetarian options, fish, poultry, lamb and game from the forest is served. In the summer, you may wish to dine outdoors on the terrace overlooking the garden and enjoy the panoramic view of the surrounding forrest.